The City’s Recreation and Parks Department has completed projects and upgrades to parks and recreational facilities to the value of nearly R19,5 million in the last few months. The 59 projects were funded via three sources, namely the Urban Settlements Development Grant (USDG); External Financing Funds (EFF) and ward allocation funding. The USDG funding of R12 821 611 was used to complete synthetic pitches in Hanover Park, Seawinds and Ocean View, taking the number of synthetic pitches around the city to more than 30. The external funds were used to complete phase one of the Protea Park Skate Park as well as upgrades of R500 000 each at the Nyanga rugby field, Nyanga football field and the Gugulethu Stadium. Through ward allocation funding, the Department was able to complete a number of upgrades to parks, recreation centres and public open spaces to the value of just over R5 million. The projects ranged from indoor gym equipment for the OR Tambo Hall in Khayelitsha, to fencing at sports fields, high mast lighting and even a universal access ramp at the Johannes Meintjies Park in New Woodlands, Mitchells Plain. ‘These are but a few of the projects on our to-do list in this financial year and we still have many more to complete, but the good news is that the number of completed projects increases all the time. It is extremely heart-warming to see projects come full circle, for the benefit of our communities. 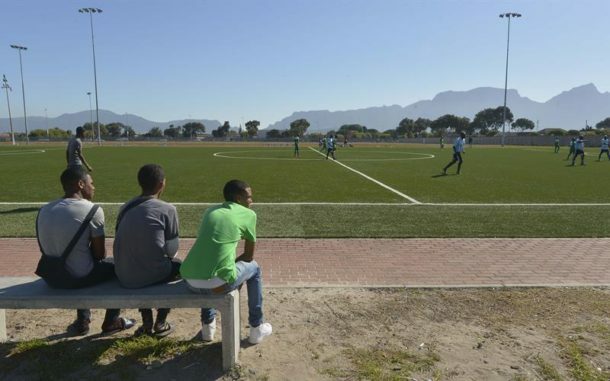 ‘We know all too well how important recreational and sporting facilities are in building healthy bodies and minds, but also how it can literally change the face of an area and provide a positive outlet, particularly for young people,’ said the City’s Mayoral Committee Member for Community Services and Health, Councillor Zahid Badroodien. The overwhelming majority of the projects involved the upgrading of parks, public open spaces and sports fields, along with the acquisition of equipment and park furniture. ‘I commend the many ward councillors who have seen the value of investing their ward allocation funding in community assets like parks and sports fields. What is key now is ensuring that communities who are benefiting from these upgrades and new facilities take ownership of them. ‘We speak often about our battle with vandalism and while it is an ongoing problem, we have also seen examples of where community involvement and investment have nipped anti-social behaviour and crime in the bud. One such example is the Gugulethu smart park. The facility caters to a relatively large community who report illegal activities and maintenance issues as they arise. The end result is that vandalism is not a problem at this park; although wear and tear from sustained use is. Needless to say this is a far more pleasant problem to have than spending our repairs and maintenance on the ravages of vandals and thieves,’ said Councillor Badroodien. ‘Residents and members of the public are our eyes and ears and the sooner they report faults, the sooner these can be fixed. This also reduces the risk of a complete deterioration of our facilities. More so, I want residents to exploit the facilities in their neighourhoods. If more people use the parks, outdoor gyms and recreation centres, the gap for the minority of people who have an ill intent will get smaller,’ said Councillor Badroodien.